R is for Ronnebeck! : Something New : The Macroon! Something New : The Macroon! Have you ever avoided something your entire life and then BAM in a second fall in love with that very same thing? Yeah, that’s me. Miss “I don’t like that” and then when I actually try it, I LOVE “that”. In all my potluck years I have avoided certain desserts because they didn’t include chocolate or caramel. I must admit that I am a fiend if it has chocolate or caramel or BOTH – I cannot be stopped. I also avoided them because I grew up “not liking coconut” though I think it was actually my Mom who didn’t like coconut; I actually really like coconut! Yesterday after lunch Mindy (my co-worker) offered me a two bite macaroon; in light of my ‘something new’ campaign I quickly popped one in my mouth, then two… by the end of the day probably in excess of 5… they’re delicious! I could eat an entire box, and would. They don’t even have caramel … or chocolate… though I hear chocolate is often added to these delicious stacks of yum! 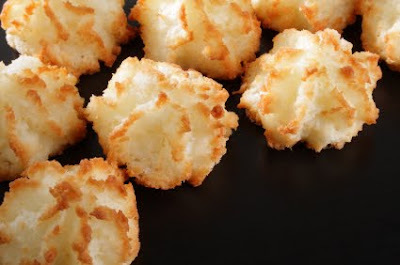 I officially ♥ Coconut Macaroons!